The Belmont Forum supports ‘international transdisciplinary research providing knowledge for understanding, mitigating and adapting to global environmental change’. The Belmont Forum fund research and themes include sustainability, climate predictability, ecosystem services and arctic observing. The group considers research to be part of a value chain which is socially responsible, inclusive and provides innovative solutions. Furthermore, open data policies and principles are considered essential to making informed decisions in the face of rapid changes affecting the Earth’s environment. Andy Turner of NCAS and the University of Reading Meteorology Department, leads a Belmont Forum funded project, BITMAP, also jointly funded by JPI Climate. BITMAP is the ‘Better understanding of Interregional Teleconnections for prediction in the Monsoon and Poles’. The research is an Indo-UK-German collaboration between the Indian National Centre for Medium Range Weather Forecasting and the universities of Reading and Hamburg. As is regularly the case with Belmont funding calls, a multi-national consortium was required and each of the participating countries contributed support, with NERC the relevant funder in the UK. Andy says that his project is ‘encouraging international collaboration and bridging the gap between academic climate science and the more applied needs of weather forecasting’. The project is going well and only six months from starting, a paper on an algorithm for tracking storms is already in preparation by Kieran Hunt. Andy observes that in addition to regular virtual meetings between the three countries that ‘as papers from the individual countries begin to be published, the collaboration on the project will increase and more ideas will be shared’. Scott Osprey of the University of Oxford leads GOTHAM the ‘Globally Observed Teleconnections and their role and representation in Hierarches of Atmospheric Models’, also funded by the Belmont Forum. When asked about the role of the Belmont Forum, Scott pointed to the ability of this international group to encourage ‘new international research communities for tackling large and complex environmental issues beyond the purview of most national research centres’. The e-Infrastructure and Data Management sub-group of the Belmont Forum was set up to concentrate on overcoming barriers in data sharing, use and management for environmental and global change research. By improving data sharing, data intensive research will be accelerated. The University of Reading has been involved for several years as Robert Gurney co-chairs the e-I&DM group. These principles have been embraced by many, including the European Commission and Horizon 2020 funded projects. The number of countries participating in the e-I&DM group is smaller than the parent Belmont Forum, with the active roles provided by France (ANR), Taiwan (MOST), Japan (JST), US (NSF) and the UK (NERC). 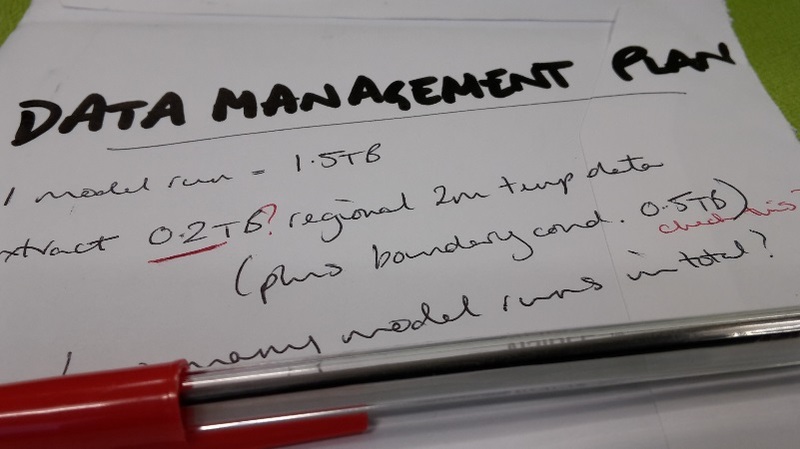 The Belmont Forum e-I&DM group is currently developing a template for data plans, intended to be a light touch, to highlight issues such as cost, documentation, anticipated restrictions on accessing data and data management after the lifetime of the project. Organisations such as NERC already have guidelines, but the Belmont Forum can help to standardise the actions of a number of countries. Andy Turner identified that flexibility from funders is the key when asking for a data management plan at proposal stage, that ‘only very rough estimates of data sizes might be possible and it is difficult to say at the outset how much data produced will have long-term value’. Scientists are asked to make projections in the knowledge that the change of track of the research through a project might make for changed data management needs. Nevertheless, considering data management issues from the outset can only help to raise awareness on the value of the data projects produce and to highlight the potential value in reuse. The Belmont Forum provides the opportunity to produce joined-up thinking from science funders and councils. The group uses its global reach to influence and fund collaborative research and to work on specific issues for data intensive environmental research. The data behind this research, which is channelled into discussions, analyses and papers, is also being more widely acknowledged as a valuable resource in itself. The Belmont Forum is providing leadership and agreement to develop and disseminate best practice for the data themselves.